Ayce Systems' Easi-Dentrite is a simple to use glue puller for the removal of small shallow dents that are inaccessible using conventional PDR tools. Repairs are carried out by attaching the relevant glue pulling tab to the panel using our high strength hot melt glue. Allow to cool for approximately 30 seconds. Place bridge over thread of foot and attach pressure screw. Tighten down pressure screw until form resistance is felt. Continue to tighten screw in small steps, allowing short intervals between each turn, until the dent is removed. A high spot remover is also included to finish off any imperfections. Glue gun, aluminium bridge, plastic feet, round glue pulling tab, oval glue pulling tab, studs, glue sticks, plastic dent punch, plastic spatula, glue pulling knob and bridge feed adjusting knobs all housed in a foam inserted carry case. 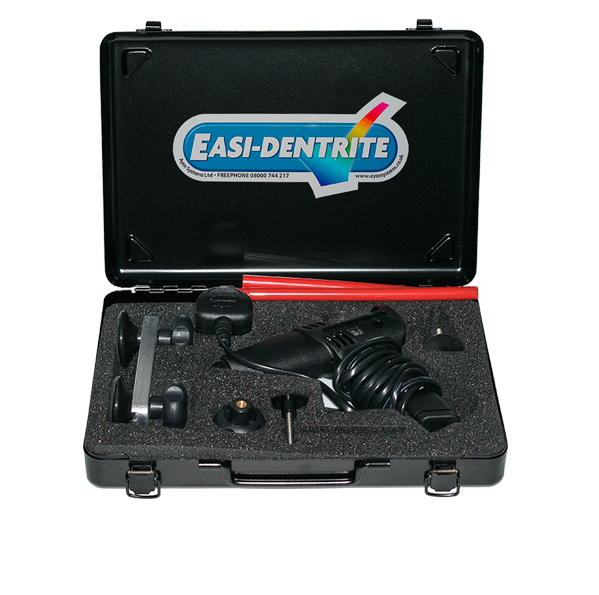 For more information about our Easi-Dentrite Repair Kit click the button below to download the print friendly PDF brochure, or if you would like to receive a quote for this kit, please click the request a quote button.